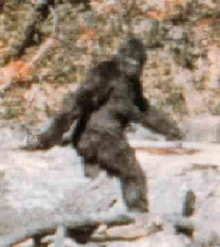 Shown here is frame 352 of the Patterson-Gimlin film. It is the most famous frame of the short film, appearing to show a clear view of a female bigfoot striding along a riverbank in northern California. The footage they took has been the focus of intense debate. Skeptics insist the creature is simply a person in an ape suit. Supporters counter that special-effects techniques were not good enough in 1967 to have created such a convincing costume. The quality of the footage is too poor to allow a definitive decision to be reached based on the film itself, but given that Bigfoot continues to elude detection, odds are that the skeptics are right.